Welcome to California Stitching, which chronicles my sewing and embroidery activities. 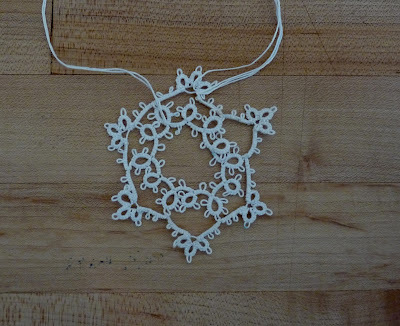 In the last post I mentioned how I was having difficult in tatting "Hearts in a Snowflake" by Jon Yusoff. Well, after several attempts, here it finally is. It still doesn't look right, so I may attempt it again after a bit. My previous attempts were tatted in DMC Cebelia 20, but this and the ones that follow are tatted in Handy Hands Lizbeth 40. 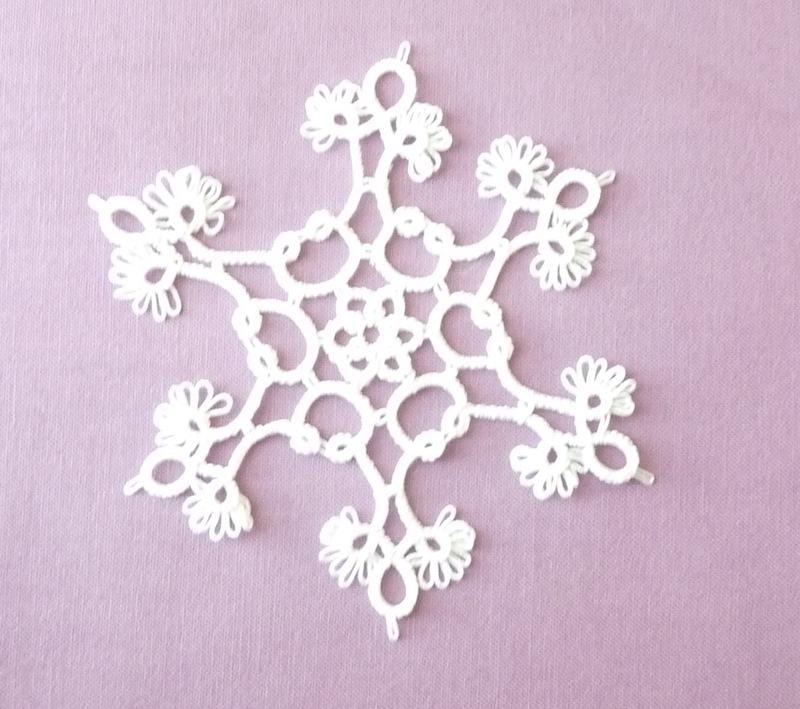 This is Snowflake 2, from Festive Snowflakes & Ornaments, published by Handy Hands, Inc. It was much easier to work that the Hearts. 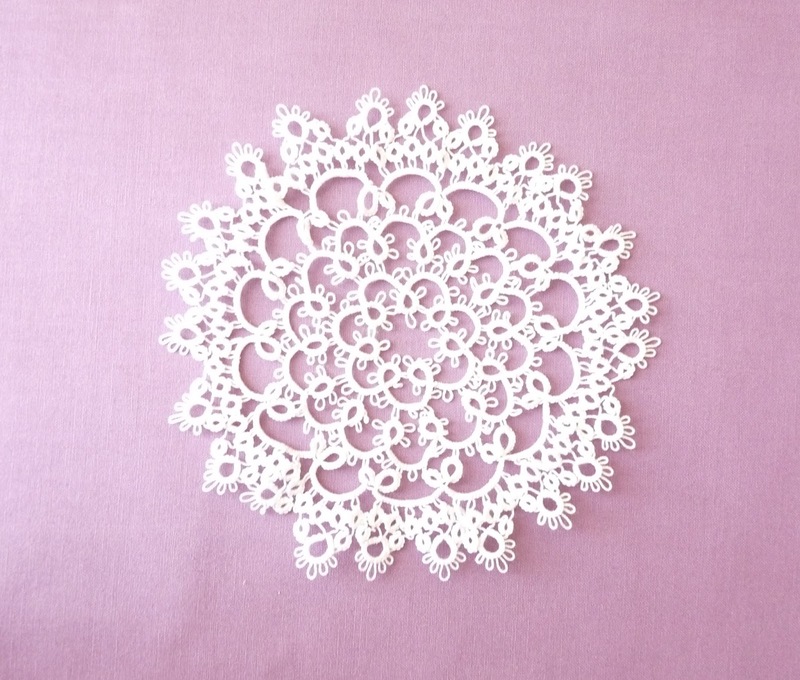 And finally, this is a doily from a book that is currently in storage, so I can't give you the reference. As I recall, it's a pretty good book, with clear instructions and diagramming. But what is odd about this pattern is that the outer row, the "hens and chickens" is just too big to fit properly. If I were to take a (much) better picture, you could see how the rings are somewhat squished together. I could only get it flat by steaming it pretty hard with the iron. I worked this in the car earlier this month when we went back to California to help with my niece's baby shower. Speaking of which, I need to work on a quilt for her. Next few posts will be about quilting/sewing! 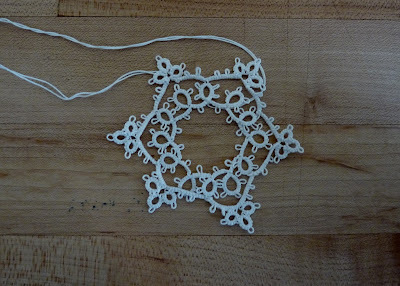 And maybe some embroidery. We sold our house and have moved to Colorado! 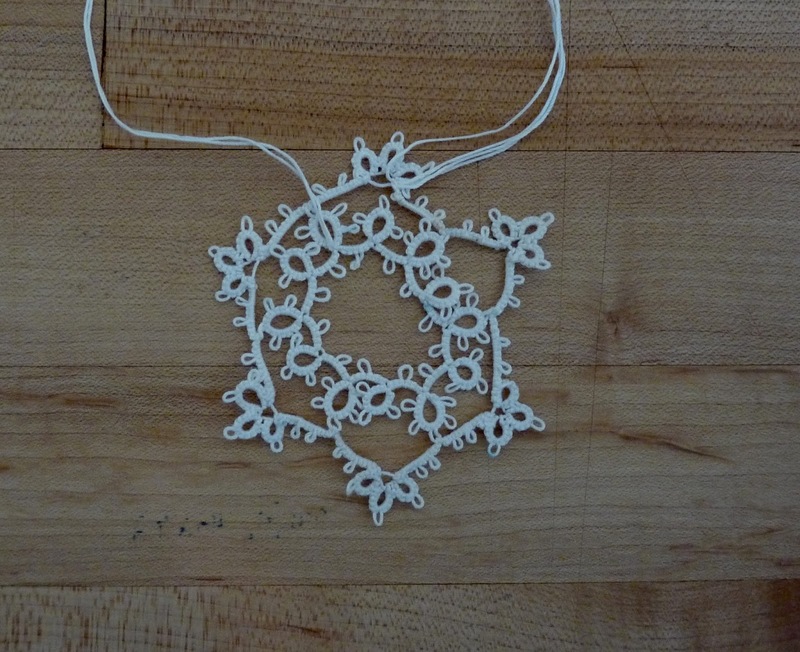 The library in town has a tatting group that meets once a week and we are making snowflakes for a fundraiser. 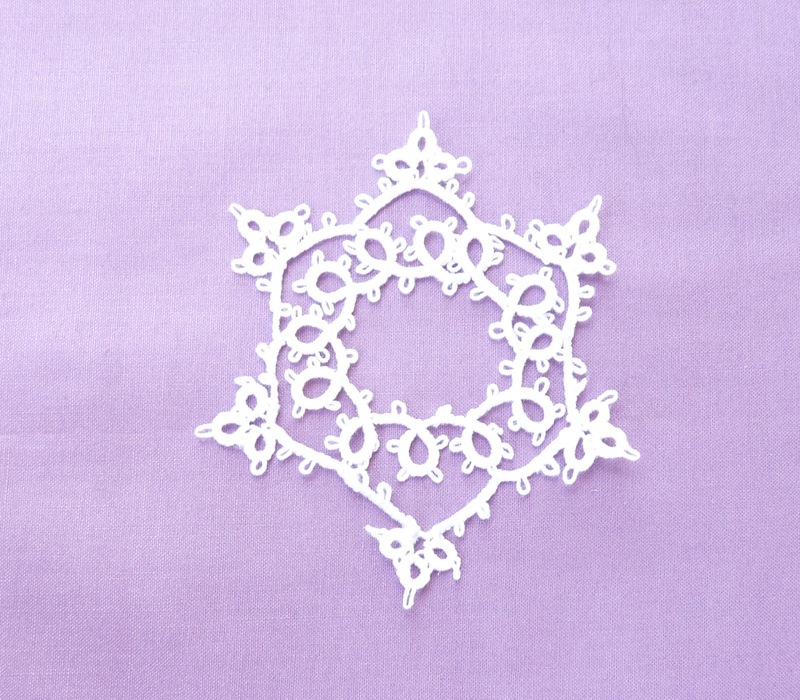 This is my first attempt at Hearts in a Snowflake by Jon Yusoff. Please follow the link to see how it's supposed to look! 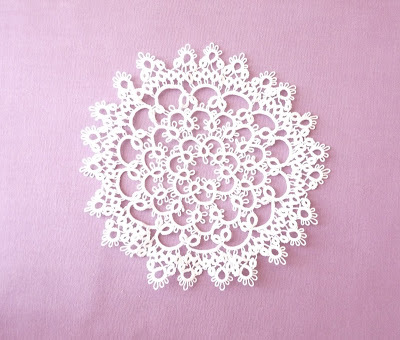 This is absolutely a wretched piece of work, with gaps in the clovers, twisted joins and all sorts of other twists. Setting it down uncompleted for several weeks didn't help, either. 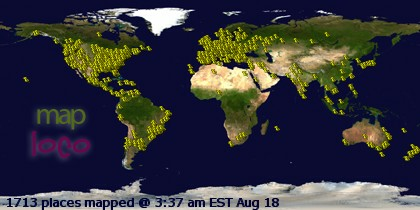 I started it again and already it's looking much better. I colored the picots that the second row needs to join to with a blue washout marker because when I started it, I joined to three rings in a row. That certainly didn't work, so I snipped it out and started the second row over. Here it's completed, still not great, but better. 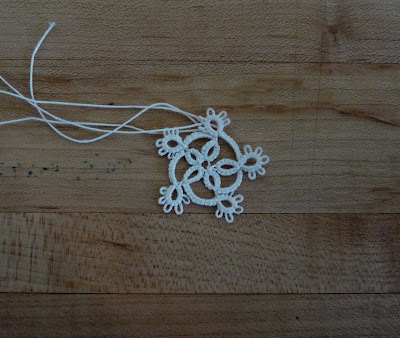 I need to block it much better and stretch out the clovers so the insides look like hearts. They certainly don't now. 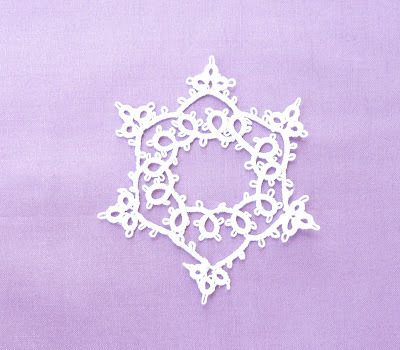 This is a snowflake from Rebecca Jones' book, The Complete Book of Tatting, which is a great resource for tatters. But I always thought that snowflakes were six sided, and not especially round. There are some in the book that are a little more pointy, so I'll try them. 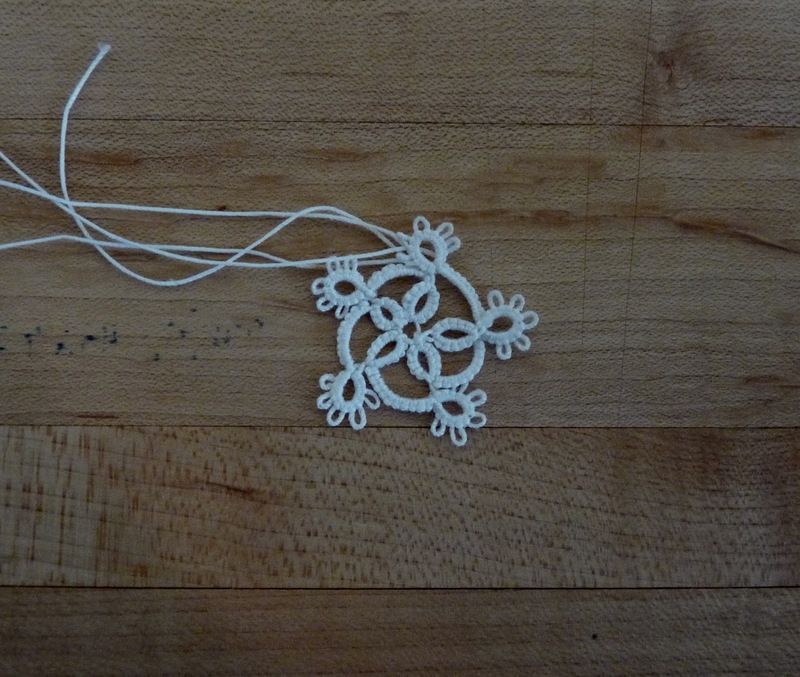 I made all of these with DMC Cebelia 20 thread, but after a few more I'll try a finer thread. I know the photos could be much better; I'm lighting challenged. Now that I'm no longer a Californian, I've been asked if I'll change the name of the blog. Yes, but I still haven't settled on a new name, so please be patient. About our move: We closed escrow on the house on July 20, the movers came the next day and Mr California Stitching and I took our 19 year old cat, Oscar, and left that afternoon. Oscar was surprisingly good on the trip, as long as we left his cage open so he could stretch out and sleep. We are now pretty much settled in an apartment waiting to start building our new home, which should start in a week or two. Later this week we travel back to California for my niece's baby shower and will be back in Colorado next week. 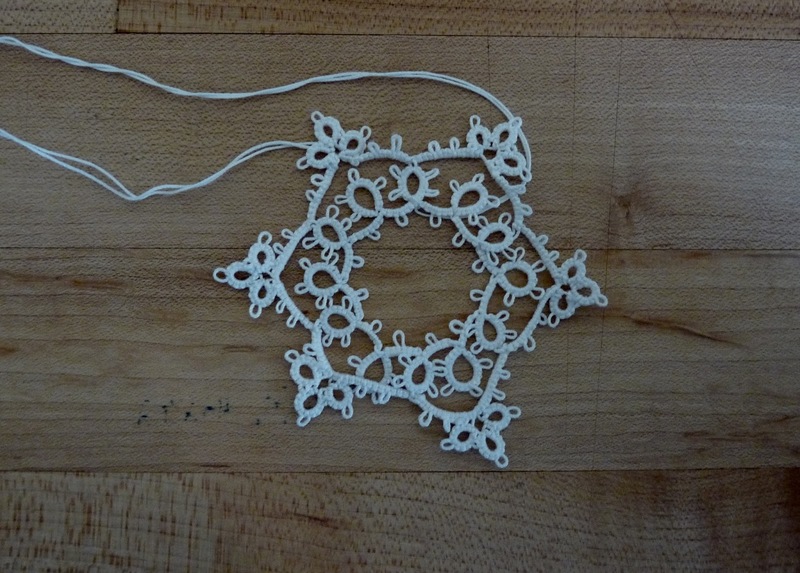 New Course at With Threaded Needle! Crocheted C2C Wedding Gift Afghan ~ It's HUGE! Show at Elfriede’s Fine Fabrics!